Next Post > Neon Capretta Superwash: Color to the max! Okay. That is not an actual quote as Dwight Schrute is not an actual person, but I’m pretty confident that if he was real, he would totally make that statement. Needless to say, I would agree with him 1000%. Perhaps the thing that I love most about fall is the soul fortifying relief that it offers after the sultry days of summer. Having grown up in the high desert as a child, I relish the opportunity as an adult to surround myself with the spectacle of deciduous trees in autumn. Between the crisp, earthy air and brilliantly colored landscape, my nesting (and creative) tendencies kick into high gear. In the spirit of Fall and all things Hygge, the KP staff have put together our semi-official list of our favorite fall things. Fall is the perfect time to channel your Hygge mood. 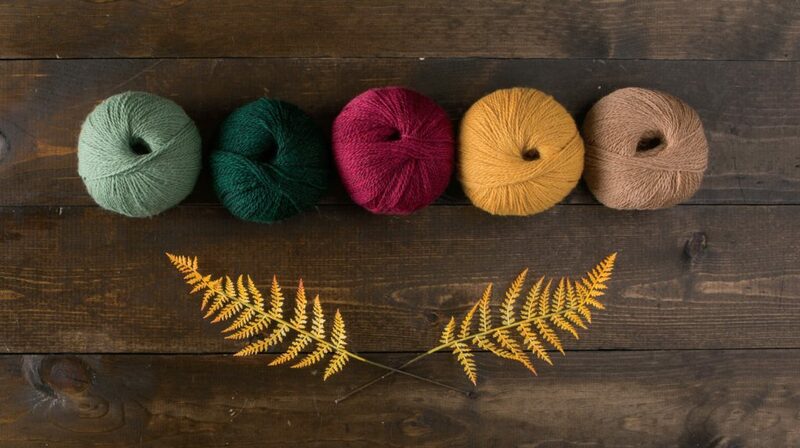 Knitwear just screams cozy and we have some sweater patterns that are begging to be knit and worn around your house this Fall! This cocoon style sweater is knit in luxurious Capretta yarn, making it Hygge approved! Ward off the morning chill or lounge around your house in this flattering sweater. This gorgeous, textured afghan is meant to snuggle under when the temperature drops. Knit in a bulky yarn, this afghan knits quickly but the basic cable design makes it a fancy classic. This thick and cozy basket weave stitch is worked entirely in knit and purl stitches with a simple garter stitch border to frame it. The bias slant, made by increases and decreases at the beginning and end of every other row, make this wrap have a gorgeous drape. Take Hygge on the go and add this to your wardrobe or curl up with a good book with it! Fall for me means curling up with a good book when the weather turns nasty outside. Whether it’s a brand new book, an old favorite or a lively audiobook, you can bet I’ll be lost in book more often than not. (Plus, I’ve situated my knitting space where I’m able to prop my book so I can read while working on projects.) Here are some favorites, new & old, I’ll be diving into. It’s been far too long since there has been a new Cormoran Strike novel and I am so excited that Lethal White has finally been released. Written by Robert Galbraith (also known as J.K. Rowling), the Strike novels are engaging and suspenseful, with well written, intriguing characters and unexpected twists and turns. I’m trying not to read it all in one sitting, as I know it’ll be another long wait, but it’s hard to put down. If audiobooks are more your thing, the Strike novels are also fantastic and read by the same narrator throughout. (The recent TV series was also quite good). Kate Atkinson, probably my current favorite author, also has a new book out this fall, but a book I’ve read multiple times is her stunning novel Life After Life. I’m planning on rereading it again this fall, because I always discover something new with each rereading. Atkinson uses an unique narrative style telling the life story of Ursula Todd, exploring how how small decisions can sometimes impact the future. It’s brilliant and heartbreaking and a wonderful novel. Finally, as I’ve mentioned above, I like to often give my eyes a break and plug into an audiobook. My favorites are always full cast recording and I’ve not found anything better than the His Dark Materials trilogy from Phillip Pullman. Narrated by Pullman himself (who has a wonderful grandfather-y voice that I love), this 3 book series tells the story of young Lyra and Will in a fantastical other worldly setting. Filled with adventures, heartbreak and philosophical questions, it’s the one fantasy world I would happily go live in (with few caveats.) The audiobooks are marvelous, with over 20 actors playing the characters, tied together with Pullmans brilliant narrative. These audiobooks (and the companion books) have gotten me through a long knitting session many times! I’m nothing if not predictable. So, sticking with all things cozy, easy, and chocolate I highly recommend this dutch baby pancake recipe. It’s so easy to whip up on a moment’s notice, smells heavenly and looks gorgeous as it comes out of the oven. Keeping things Hygge means simplicity, coziness and togetherness; basically the definition of every dutch baby pancake recipe! This is my go-to recipe for both stocking my pantry and also gifting later on in the holiday season! This is such an easy recipe and is wonderfully customizable. Add a touch of cayenne pepper for some spice or vanilla bean for extra coziness. For a brief moment in college I dabbled with the idea of being a cinematographer, cementing my affinity for celluloid. What better time to indulge in your favorite movies then when the crisp fall winds start to howl through the falling leaves, and that stash you (I) have ignored all summer needs some love? Here are three of my go-to Fall classics. Number one my list, and in my heart, is Arsenic and Old Lace. This 1944 Frank Capra classic is a delightful and endearing romp through the macabre. Cary Grant plays Mortimer Brewster who discovers on the day of his wedding that his doting Aunties are actually serial murderers with a benevolent twist. I’d say try your hand at some lace work while watching it but you might drop a stitch during a scene stealing pronouncement of CHARGE! I have a thing for classics so next up of course is Alfred Hitchcock’s 1954 Thriller Rear Window. Jimmy Stewart stars as LB, a photographer that is wheelchair bound after breaking his leg and occupies himself spying on his neighbors from his NYC high rise, believing one of them killed his wife. He could have stayed out of trouble if only he knew how to knit or crochet. The mystery of “Did he or didn’t he?”, and those LB enlists to uncover the answers make for an exciting afternoon on the couch. Fun fact: it was all filmed on the Paramount Studio Lot, where they had to dig 20 feet down to give the illusion of the 60ft high apartment buildings since the studio space wasn’t to Hitchcock’s liking. My last favorite movie to watch in the fall is not a black and white classic, although I could surely rattle off a hundred more, nor does it involve murder (amazingly). WALL-E is my final recommendation. This is my favorite Pixar release. I absolutely love the world that they create for WALL-E. It’s so dense with beautiful imagery and who doesn’t love a Robot love story? I am charmed by the quietness of the film and quirky like robot homage to Johnny 5 from Short Circuit. I’m inspired to make cozy scarfs and wraps for the ones I love when I watch this. There you have it. Our collective list of all things indulgent and comforting, from our nook to yours. Stay cozy out there everyone! Love, love this post. Books, Knitting, Fall…what could be better?